I know all of us have some sort of "thing" that gets us motivated to go to the gym and workout. 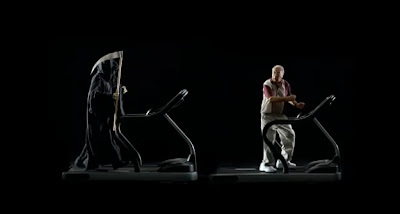 Well Crunch thinks you should be motivated by the grim reaper chasing you down unless of course you motivate yourself to go to the gym and ward him off! The spot below features just that. 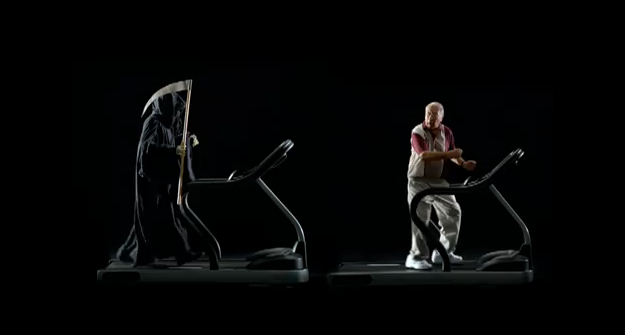 As you will soon see, the grim reaper is chasing this poor old man on a treadmill, but from the looks of it I don't think he will catch him seeing that they are on two different treadmills haha. Anyways, is this a good way to motivate people to exercise especially with the new year right around the corner and people looking to make classic new years resolutions as "I promise I will go to the gym more". Would love to hear your thoughts! Enjoy!